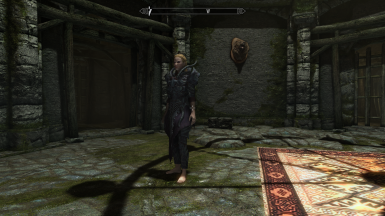 A bug with the female Falmer Heavy Armor mesh caused a gap to appear when wearing the armor with no footwear, or footwear which didn't cover the calves. This mod fixes this bug. To install, just use a mod manager, or add the loose files to the Skyrim directory. This should be compatible with anything that does not already alter the female Falmer Heavy Armor mesh. Unfortunately, this means it will conflict with some body replacer mods, such as CBBE. Placing this mod lower in the load order will fix the bug but may introduce some clipping/seams. Alternatively, you could use something like BodySlide to fit this mod to other body shapes.